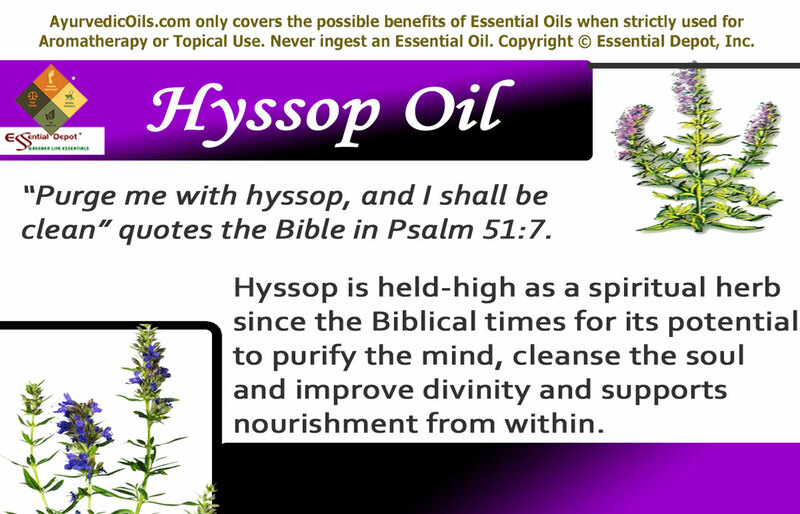 Bible reveals the genuine use of Hyssop by saying “Purge me with hyssop, and I shall be clean” in Psalm 51:7. Hyssop is held-high as a spiritual herb since the Biblical times for its potential to purify the mind, cleanse the soul and improve divinity and supports nourishment from within. The name Hyssop is extracted from the Hebrew word ‘azob’ meaning ‘holy herb’ and was used in temples and other sacred places as a cleansing agent. The essential oil is extracted from the leaves and flowers of this perennial plant and is botanically known as Hyssopus officinalis and is a part of the mint family, Lamiaceae. 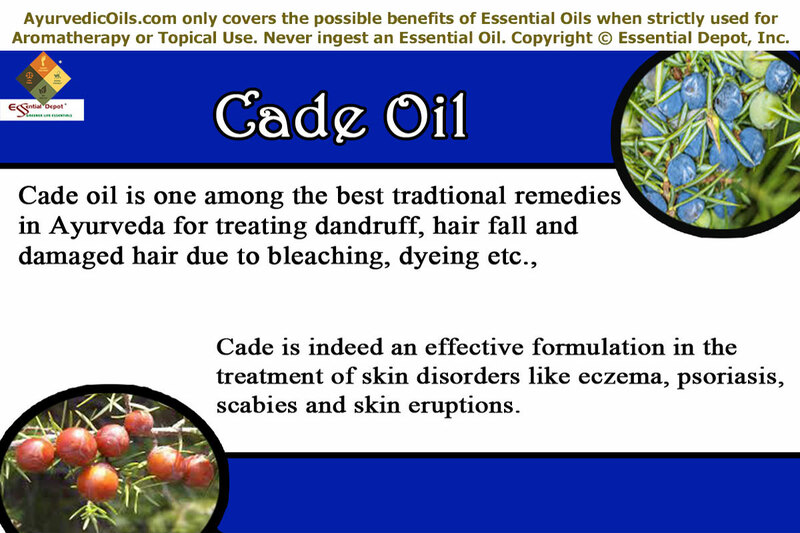 It has been honored as one among the 12 main oils of the Scripture. Ayurveda recommends the use of Hyssop and its essential oil for treating respiratory problems like chronic catarrh, cold, cough, congestion and asthma. It was also used for regulating high blood pressure, treat flatulence and colic, reduce fever, release heavy emotions, support deep breathing and improve the immune power. Hyssop is known as one among the oldest herb used by human beings. Hippocrates, the renowned physician prescribed Hyssop for treating bronchial problems, inflammation, chest congestion, throat infections and pleurisy. The ancient Romans used Hyssop for protecting themselves from plague. They prepared a medicated wine using Hyssop leaves and flowers and valued it as a natural remedy for plague and certain other health disorders. Hyssop tea, infusion and tincture have been used in the treatment of dropsy and jaundice. “Take a bunch of hyssop, dip it into the blood in the basin and put some of the blood on the top and on both sides of the doorframe. Not one of you shall go out the door of his house until morning.” Exodus 12:22, is another Biblical verse talking about the greatness and purifying abilities of Hyssop herb. Bible also records the use of Hyssop by influential Biblical leaders including Jesus, Moses, Solomon and David. There are about 126 verses in the Bible that talk about Hyssop. It was also used in cleaning and polishing sanctified places. Persians used Hyssop oil in skin lotions to augment their complexion and enhance skin health. It was used by the Europeans as air freshener and the traditional Indians used Hyssop for healing wounds, treat bruises, lessen excess fluid content in the body and to alleviate muscular pain. Hyssop is also a popular ingredient of Chartreuse liquor. The most important chemical constituents of Hyssop essential oil are myrcene, a-pinene, limonene, camphene, isopinocamphene, b-pinene, 1,8-cineole, sabinene, y-terpineol, thujone and pinocamphone. These components contribute to its remedial properties like expectorant, anti-rheumatic, diuretic, astringent, stimulant, antiseptic, emmenagogue, antispasmodic, vulnerary, carminative, sudorific, cicatrisant, nervine, digestive, vermifuge, febrifuge, tonic and hypertensive. Ayurveda is the wisdom of spiritual and holistic healing that has been in practice since 5,000 years. This ancient philosophy identifies disease as an opportunity to explore the actual cause lying behind an illness. Identifying the root cause of an illness and treating it paves way for prevention of diseases in the future, leading a healthy life and progressing towards longevity. Whereas the contemporary medical system treats illnesses without analyzing its root cause, by this way the disease gets suppressed inside for the time being and grows as a major root for chronic disorders in the future. Ayurvedic philosophy is based upon five major elements of nature, namely fire, water, earth, air and space. It is strongly believed that the universe is made up of these five elements and everything on this universe is made up of these elements including human beings. With a combination of these vital elements, every individual has a unique constitution that comprises of three biological energies known as doshas. They are vata, pitta and kapha. These doshas are a combination of the five elements of nature. Vata represents air and space, pitta is combination of fire and water and kapha signifies water and earth. Vata dosha is responsible for nervous functions, movement, circulation and respiration. Pitta energy governs digestion and metabolic functions. Kapha type controls the structure and sustenance of the body and the movement of fluids in the system. Every human being has a predominance of any one of these doshas that depicts their personality, behavior, physical and emotional attributes. Balance between these doshas symbolizes health and imbalance causes illnesses. Ayurvedic remedies focus on regularizing dosha imbalances and include essential oils, herbs, meditation, yoga, physical exercises, prayers, Ayurvedic routine and a healthy lifestyle with a balanced diet. Hyssop essential oil has been used in Ayurvedic healing for treating excess kapha along with pitta and vata deficit. 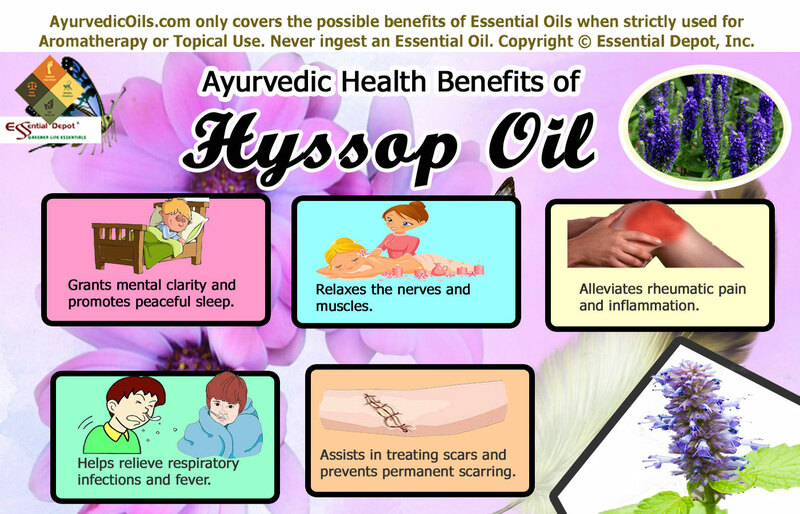 Let’s take a look at the Ayurvedic health benefits of Hyssop essential oil based on the suggested methods of usage. Ayurveda trusts in healing humanity through the five major senses namely the sense of sight, sense of sound, sense of touch, sense of taste and the sense of smell. Using Ayurvedic essential oils in bath and in Abhyanga, the art of Ayurvedic massaging treats illnesses of the mind and body through the sense of touch and the sense of smell. Skin is the largest organ of the body and is the fastest mode to transmit the therapeutic molecules of essential oils to penetrate deeply into the blood stream. When used in bathing water, the aroma of the essential oil passes through the nasal passages and passes onto the limbic system, which is the control center of the brain. By this way the remedial properties of the oil gets conveyed to other parts of the body in the form of control waves by the limbic system. Add 2 drops of Hyssop essential oil in warm bathing water for relieving from fatigue, anxiety, menstrual pain, flatulence, viral infections, low blood pressure, respiratory infections, urinary problems, fever and skin infections. Taking bath in this medicated water before going to bed can assist in promoting peaceful sleep, mental clarity, relaxation of muscles and nerves. It also helps in eliminating excess fluids and toxic substances in the body through urine and sweat. Blend 3 drops of Hyssop essential oil with 1.5 ml of sesame oil and gently massage it on your abdomen for treating dysmennorhea, promoting blocked or delayed menstruation, regularize the menstrual cycle and alleviate menopausal symptoms like stress, hot flashes and discharges with its emmenagogue, stimulant and tonic properties. Massaging the painful area with this blend also helps in expelling excessive salts, fluids, sodium and other toxic substances in the body through urine. By this way it helps in reducing swelling, inflammation and rheumatic pain. A 2002 study on ‘The muscle relaxing activity of Hyssopus officinalis essential oil on isolated intestinal preparations’ have proved that Hyssop oil is effective in treating muscular pain by relaxing the muscles and reducing the amplitude of spontaneous movements. Hyssop essential has the potential to increase pitta dosha, which is responsible for metabolic functions and digestive fire. Massaging your stomach and abdomen with 2 drops of Hyssop oil blended with 1 ml of olive oil can help in relieving from gas, flatulence, colic and indigestion. The carminative, digestive, vermifuge and stomachic properties of Hyssop oil aids in increasing the secretion of digestive acids and gastric juices that supports indigestion, colic, intestinal gas and spasms and kills intestinal worms. Massaging your foot soles with 2 drop of Hyssop oil mixed with 1 ml of warm coconut oil can help in reducing your body temperature and treat fever effectively with its febrifuge properties. 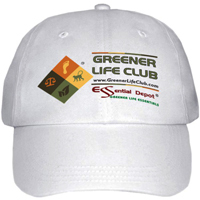 It promotes urination and supports to get rid of all infectious organisms causing fever through sweat and urine. A 2010 study published in the BMC Complementary and Alternative Medicine, Hyssop essential oil has been proved to weaken the flu virus and weakens the ability of influenza to affect cells. Massaging your body with 10 drops of Hyssop essential oil mixed with 5 ml of coconut oil can assist in relieving tension, mental fatigue, anxiety, sore muscles, microbial infections, pain, inflammation, headache, low blood pressure, flu, tonsillitis, dermatitis, eczema, sore throat and asthma. This massage blend aids in stimulating your system by enhancing your immune powers and acts as a tonic to your digestive system, nervous system, endocrinal system, excretory system and circulatory system. Go for a Hyssop massage every weekend to revitalize your senses and your system for the week ahead. Excess of kapha dosha is responsible for respiratory problems like cold, cough, chest congestion, nasal congestion and breathing difficulties. Hyssop essential oil controls excess kapha and assists in relieving respiratory disorders including heavy catarrhal conditions. This oil also has expectorant, decongestant and diuretic properties that help in expelling excess of phlegm and mucus deposits in the chest, bronchial and nasal passages. Hyssop is listed as an effective expectorant by the University of Maryland Medical Center that can support in eliminating mucus from lungs and in alleviating whooping cough. All you need to do to relieve from your respiratory problems is to add 2 drops of Hyssop essential oil in steam inhalation. The sweet-camphoraceous, warm and powerful aroma of Hyssop oil assists in treating anxiety, mental fatigue, stress, negative feelings and other mental woes. Hyssop is used as an effective mental stimulant for calming the mind and soothing the nerves. Add 2 to 3 drops of Hyssop essential oil to your diffuser, burner or aromatic lamp for relieving nervous tension, alleviate negative emotions and purify the mind. This oil is also known to grant mental clarity, augment creativity and assist meditation peacefully. On a spiritual perspective, Hyssop essential oil is recognized as a spiritual remedy to forgive sins and attain spiritual oneness. Hyssop essential oil has antiseptic, cicatrisant and vulnerary properties that make it the most ideal oil for treating skin problems. Being an antiseptic and vulnerary oil, Hyssop aids in protecting wounds, cuts and abrasions from being septic. It invades the presence of micro-organisms like bacteria and virus and protects the wound from microbial infections, paving way for quicker healing process. The cicatrisant value of Hyssop essential oil assists in diminishing scars and prevents the skin from permanent scarring left by acne, boils, accidents, insect bites, pregnancy, pox and surgeries. Mix 2 drops of Hyssop essential oil to your regular skin care cream or daily lotion and apply it on wounds, infections, cuts, scars, marks, acne and insect bites for effective results. Using this aromatic blend on your scars, stretch marks and other marks on the skin helps in promoting cellular regeneration and growth of new skin cells that assist in fading away existing scars and marks on the skin. Add 2 drops of Hyssop oil to your vapor rub and apply it gently on the chest, throat and back for effective relief from whooping cough, cold, headache and nasal congestion. This is only for the purpose of information and is not intended for treatment or to substitute any prescribed medication or professional medical advice. Never take essential oils internally. 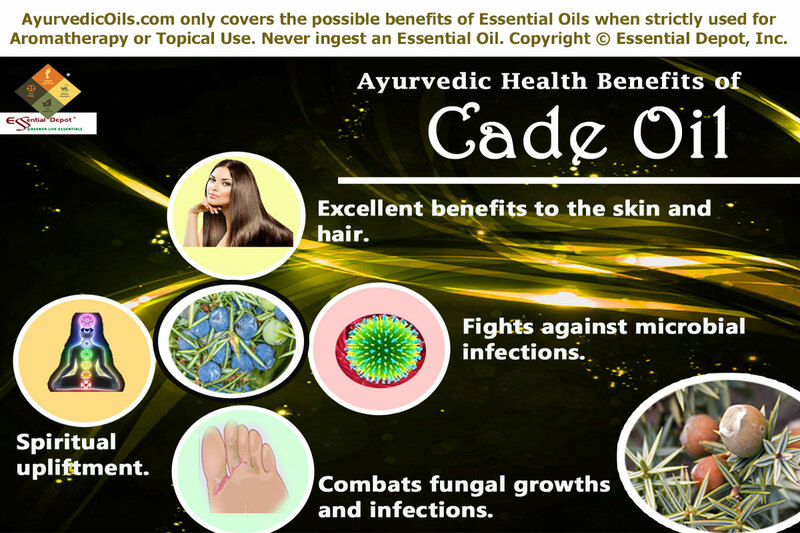 Ensure to use them in a diluted form as pure and organic essential oils are highly concentrated substances and can cause harm if used directly on the skin. 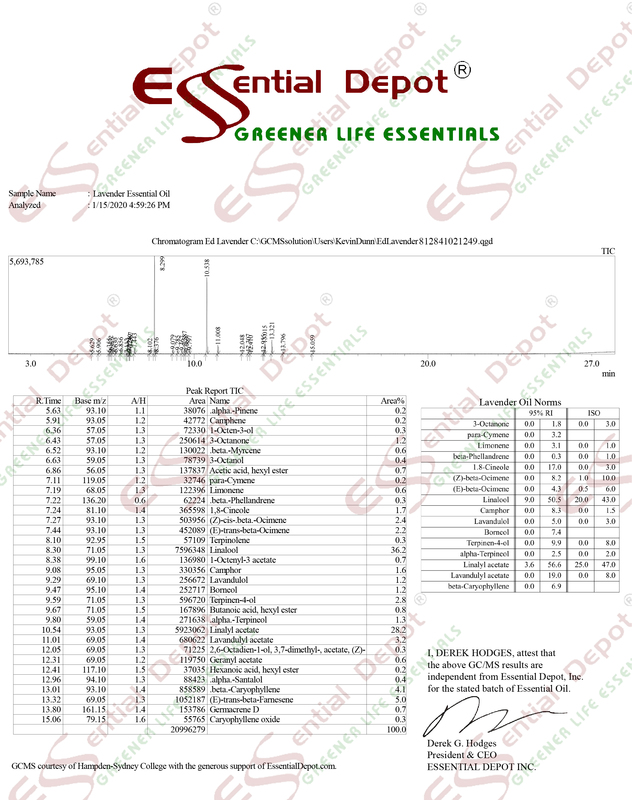 Consult your Ayurvedic physician before choosing the right essential oils for your unique individual constitution and precise health condition. Be cautious before using essential oils if you are nursing or pregnant.